myhomefone™ is compatible with most hearing aids. Because it runs on the 3G cellular network, myhomefone™ will work in a power-fail. The base has a rechargeable battery with up to 5 hours on standby. Equipped with an amplifier in the handset – a single press boosts the volume to 40dB. Ideal for those with large fingers or less than perfect eyesight. A simple SOS button on the reverse of the handset allows the caller to instantly call a pre-loaded urgent contact number or their choice of emergency response service or professional monitoring. 3G network No nbn™ or landline needed – myhomefone™ is an nbn™ alternative, cordless home phone. Hearing aid compatible myhomefone™ is compatible with most hearing aids. Power-fail backup Because it runs on the 3G network, myhomefone™ will work in a power-fail. Voice amplifier Equipped with an amplifier in the handset – a single press boosts the volume to 40dB. Large keypad buttons Easy for big fingers and those with less than perfect eyesight. 2 inch screen Displays large numbers and characters. Rechargeable backup batteries Keeps your cordless home phone operational in the case of a power-fail. Speed dialing Supports up to 9 speed dial numbers. Contacts memory Supports up to 150 names and numbers. Low battery alert Will alert you when the battery is low. We believe something as simple as a cordless home phone should come with easy to understand pricing. * Prices include GST. Telstra Retail numbers 132000, 132203, 132674, 132999 are charged as excess usage. ** International Calls include all calls to landline and mobile numbers. 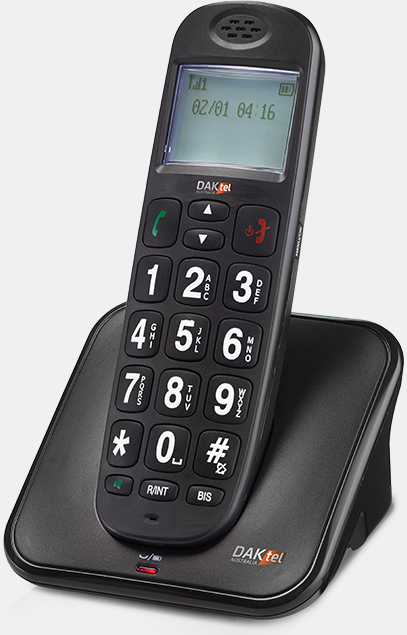 myhomefone™ is an nbn™ alternative cordless home phone that doesn’t require nbn™.